Volunteering in the animal welfare field can bring many benefits, not the least of which is connecting with like-minded people who care deeply about animals. And sometimes, a connection can evolve into more than a casual acquaintance. 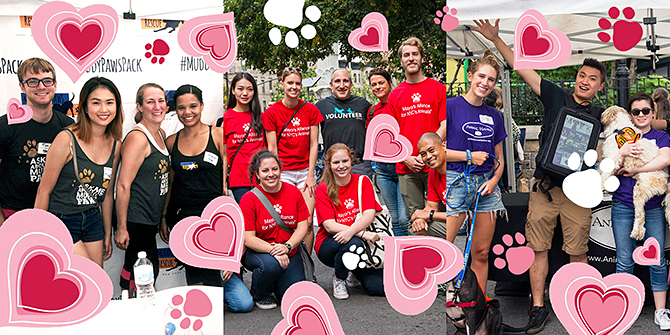 A recent article featuring the Mayor’s Alliance for NYC’s Animals on the DatingAdvice.com blog explores some of the possibilities. If you’re a New Yorker looking for someone to cuddle, you might want to check out the pet adoption events, fundraisers, and training workshops held by the Alliance. This longstanding nonprofit organization gives animal lovers opportunities to save the lives of homeless dogs and cats throughout the city, and meet plenty of viable dating prospects while they’re at it! You can adopt or foster a furry friend to keep you company and act as your wingman at dog parks or around your neighborhood. You can also attend our events and workshops, volunteer at our mega pet adoption events or your local shelter, or get involved with Trap-Neuter-Return (TNR) projects for community cats to up your social game and find a fetching companion.